In January, 1924 Stokowski and the Philadelphia Orchestra joined Victor artist Serge Rachmaninoff in what was the beginning of an historic collaboration. 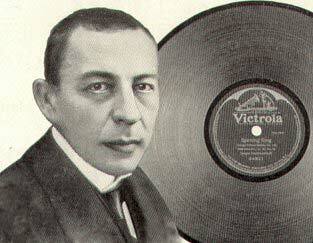 After initially recording for Edison, Rachmaninoff had become an exclusive Victor artist in 1920 1. Somewhat like Stravinsky's collaboration with Columbia and Elgar with the Gramophone Company, Rachmaninoff with Victor was one of the first extensively recorded composer-artists in phonograph history. The collected issues of his recordings, all originally on 78 RPM disks, spans 10 CDs in the Victor reissue. These recordings were restored by Ward Marston, and then apparently further processed (to their detriment) by Victor engineers. The 1929 Rachmaninoff Piano Concerto no 2 and Rhapsody on a theme of Paganini reissue received a Grammy award, which went to Victor, but not (as it should have in my opinion) to Ward Marston who made these legendary recordings available for us to enjoy. Stokowski, Rachmaninoff and the Philadelphia orchestra were to record the first and only acoustic recording, by any artists, of a Rachmaninoff concerto. This was Rachmaninoff's Piano Concerto no 2 in c minor, opus 18, composed in 1900-1901. This recording was also Victor's first attempt to capture record a concerto with symphony orchestra and soloist with the acoustic process1. The recording sessions for the concerto actually began on Monday, December 31, 1923, with the concerto's second movement. However, these sides were not approved by Rachmaninoff, so recording began again the following Thursday, January 3, 1924, in Camden, when successful recordings of the second and third movements were achieved2. As with other acoustic recordings made during this period, the orchestral composition was greatly reduced, and instrumentation changed. At this recording session, there were 7 first violins, 4 second violins, 3 violas, 2 cellos, 2 flutes, 2 oboes, 2 clarinets, 4 French horns, 2 trumpets, 3 trombones, a baritone horn, a bass saxophone, and a contrabassoon3. The bass saxophone would have replaced the string basses, since no basses were used in the recording. The contra-bassoon would have replaced timpani. Rachmaninoff played a Steinway grand piano, but a smaller model - a Steinway Model B which was raised on a platform to allow the recording horn to have better access to the piano sound. Also, of course, Rachmaninoff scored the concerto for a full string complement, and with other percussion instruments besides the timpani - bass drum and cymbals. These recordings of the second and third movements were released by Victor in May, 1924 according to the Victor catalogue2. The second movement was issued on the first three faces of two Victor double sided Red Seal disks 8064 and 8065, matrix numbers C-29233-4, C-29234-3 and C-29235-4. The third movement was issued on the final face of Red Seal disk 8065 and the two sides of 8066. The matrix numbers were C-29236-3, C-29251-2, and C-29252-2. So, the second and third of the three movements of the concerto were successfully recording at one session on January 3, 1924. As to the first movement of the Concerto, marked 'moderato', the plan was to record two 12 inch sides and one side of a 10 inch disk to encompass this first movement which typically lasts about 10 minutes in most performances. On December 22, 1924, Rachmaninoff, Stokowski, and the Philadelphia Orchestra recorded two successful sides of the 12 inch disk covering the first seven minutes of the first movement. They also recorded three takes of the 10 inch side for the final 3 minutes of the moderato movement. 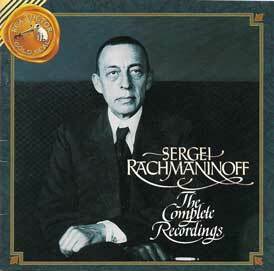 However, Rachmaninoff did not approve any of the December takes of this 10 inch disk3. Consequently, only the two 12 inch sides were complete and approved. The incomplete beginning of the first movement was not issued by Victor at the time. With the release of electrical recordings beginning in 1925, Victor would have had little motivation to complete or to release an acoustic version of the Rachmaninoff Concerto's first movement. Initially, reviewers assumed that the 1924 recording of the first movement was lost. However, the matrices for the 12 inch disk remained in the Victor archives, and was later released, restored by Ward Marston in the Victor "Rachmaninoff: His Complete Recordings ". None of the 10 inch disk sides were thought then to have survived, until the detective work of Mark Obert-Thorn made an amazing break-through, described below. This less-than-satisfactory 1924 result of an incomplete concerto was later to be corrected by the legendary 1929 recording by Rachmaninoff, Stokowski and the Philadelphia Orchestra ( 1929 Rachmaninoff Piano Concerto no 2). However, in some ways, this 1924 recording seems to me more flexible and nuanced than the later recording. I find the 1924 performance to be spontaneous, alive and supple. This is surprising, given the physically cramped and technically difficult characteristics of recording with the acoustic process. Click below to hear this superb and satisfying performance and judge for yourself. 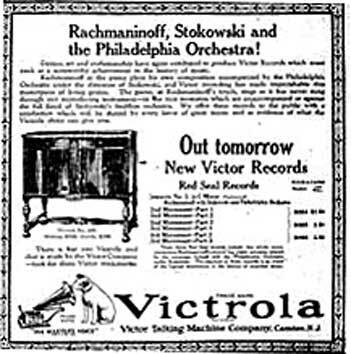 Although still incomplete, the recordings of the second and third movements of the Rachmaninoff Piano Concerto no 2 went on sale in May, 1924. at this time, Victor Talking Machine Company would have expected a further recording session to complete the first movement of the Concerto. Of course such a session did in fact take place, but without a released version of this third movement. As described above, the partial first movement of the 1924 Rachmaninoff Piano Concerto no 2 on two 12 inch Victor sides was not issued in 1924. However, Ward Marston was able to restore this music from the 12 inch matrices from the Victor vaults, issued in the RCA Victor "Sergei Rachmaninoff - The Complete Recordings". Ward Marston's friend and fellow master of recording restorations Mark Obert-Thorn reflected on the matrix number of the missing 10 in (25 cm) disc of the Rachmaninoff first movement. This matrix number B-31397 with takes 1, 2, and 3 had the usual B prefix for a ten inch disc (matrices for 12 inch discs began with "C"). He reflected that this disc would not have been archived with the other movements recordings, which were all 12 inch matrices. A search in the Victor vault among the 10 inch acoustic discs did indeed locate the long missing portion of the 1924 Rachmaninoff Piano Concerto no 2 first movement. Perhaps not newsworthy to the general public, among amateurs of these recordings, this was a major event, and Mark Obert-Thorn was justly praised. 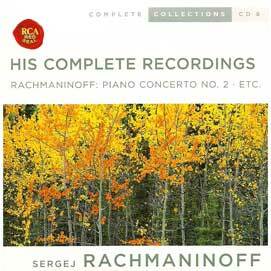 The complete 1924 acoustic recording of the Rachmaninoff Piano Concerto no 2 was for the first time issued complete in 2005 on RCA Red Seal CD 82876-67892-2. 3 Harrison, Max. 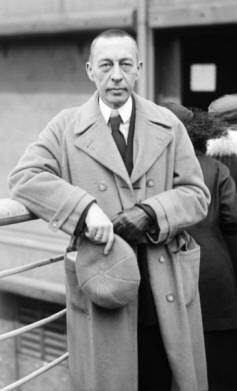 Rachmaninoff: Life, Works, Recordings. Continuum International Publishing Group. London. 2006. ISBN 0-8264-9312-2. Second - in the Chronological Discography page. For example, links to a 1926 recording are also found in the electrical recordings chronological discography page: Chronological Discography of Electrical Recordings This Chronological Discography page lists all the electrical recordings from 1925 to 1940 made by the Philadelphia Orchestra conducted by Leopold Stokowski and issued by Victor, including of course the 1926 recordings. For each recording listed in the Discography table, there is a MP3 link on the right-hand side which, when clicked, also will download the recording. The mp3 files in this site are encoded usually at 128 kbps. This means that the files are of different sizes, according to the length of the music. For example, the second Stokowski electrical recording, the April 29, 1925 Borodin Polovetzki Dances is small (3.6 Mb). In contrast, the 1929 Le Sacre du Printemps file is large. Le Sacre part 1 is 14 Mb and Le Sacre part 2 is 16 Mb. Consequently, a large file will take a longer time to download, depending on your internet connection speed. Please keep this in mind when you click to listen to (which means to download) a particularly music file. You may click the link to the music file, but need to wait a number of seconds or even minutes to listen to the file.